During my recent visit to Shanghai I sadly neglected to have any xiaolongbao, the city’s trademark soup-filled dumplings. I had previously and mistakenly believed that these delicious little dumplings were from Taiwan and that’s due in large part to Din Tai Fung, a renowned Taiwanese chain of restaurants famed for its xiaolongbao. 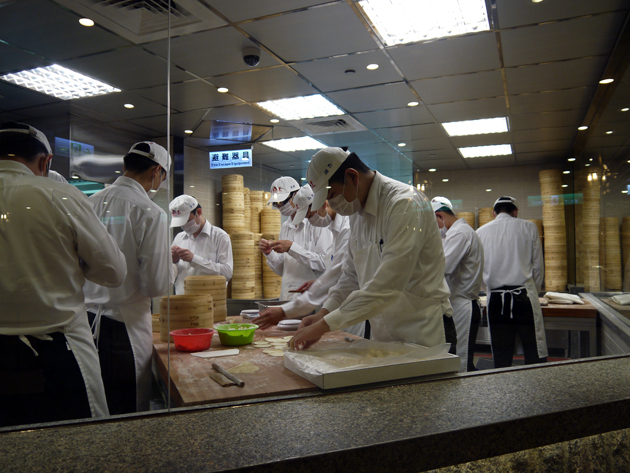 Din Tai Fung is probably one of the biggest restaurant chains that you’ve never heard of – although it has branches in ten countries around the Pacific Rim, it’s sadly missing from the UK and the rest of the Europe. The Taipei 101 branch of Din Tai Fung is located inside that skyscraper’s basement-bound food hall. Interestingly the kitchen is visible through from the dining room, although it’s partitioned off by a glass wall. A long queue was winding out of the door so snagging a reservation is a very good idea unless you have time to spare. NyanMaru and I sampled a good chunk of the menu, with some help from the friendly English-speaking staff, during a dinner with some business associates. It’s like Foxconn, but tastier. Prepare for a good stuffing! Before diving into the xiaolongbao we tried out a few of the starters. The drunken chicken wasn’t bad, but the usually distinctive taste of the rice wine that makes this simple dish so tasty was curiously muted. Go home chicken, you’re drunk. The chunky slices of cucumber in a vinaigrette dressing was a tad sweet, but otherwise unremarkable. NyanMaru wasn’t impressed either. The only vegetables of the evening. Deep-fried pork chop sounds like something you’d only eat when you’re drunk, but it was surprisingly decent. 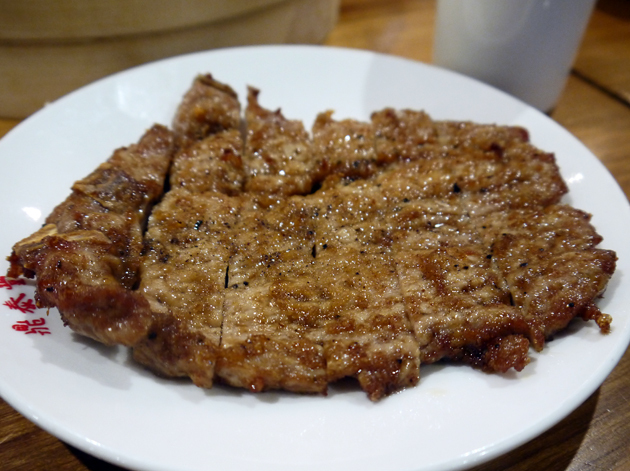 It was a touch too dry and the exterior wasn’t quite as crisp as I was expecting, but the thin slices of meat did have a pleasing-enough taste of pepper and ginger to them. I’ve seen this dish described as ‘Chinese schnitzel’ which is bit like calling a car a ‘hovercraft with wheels’. 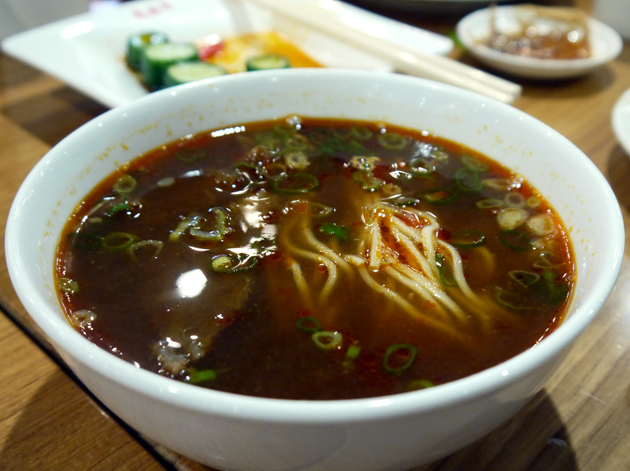 NyanMaru isn’t quite as fond of Taiwanese beef noodle soup as the Lensman, who sadly wasn’t able to make it out to Taipei to join us, so we shared a bowl in his honour. The hearty noodles were reasonably firm and accompanied by tender chunks of beef and jelly-life tendon, but the soup wasn’t quite as rich and spicy as I was expecting. I nommed some beef before taking this photo. Sorry. The main attraction at Din Tai Fung is of course the xiaolongbao. NyanMaru and I sampled several varieties, the vast majority of which don’t seem to be available in London. All of them have soft, moderately thick dumpling skins. The standard pork and ginger xiaolongbao is far more balanced than the version found back home at Leong’s Legends. The lipsmacking soup isn’t excessively salty and the small chunk of smoothly ground pork isn’t overloaded with ginger. It’s hard to make out the crab in the crab and pork xiaolongbao. The main difference between this variant and the standard pork and ginger variety is, rather obviously, the lack of ginger and a pronounced generic seafood-esque saltiness to it. These dumplings are rather disappointing and feel like they’ve been made to bulk out the menu with a nominal seafood option. 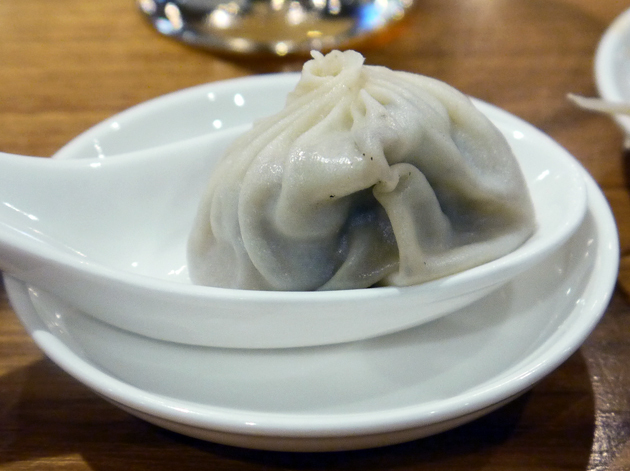 The real highlight of the evening was the pork and truffle xiaolongbao – a completely unexpected combination. These are more expensive than other Shanghai dumplings and whereas the others come in batches of a dozen, you only get half a dozen of this more rarefied variety. The truffles added a rich earthiness to the dumplings, but the amount had clearly been carefully judged as it didn’t overwhelm the meatiness of the pork. 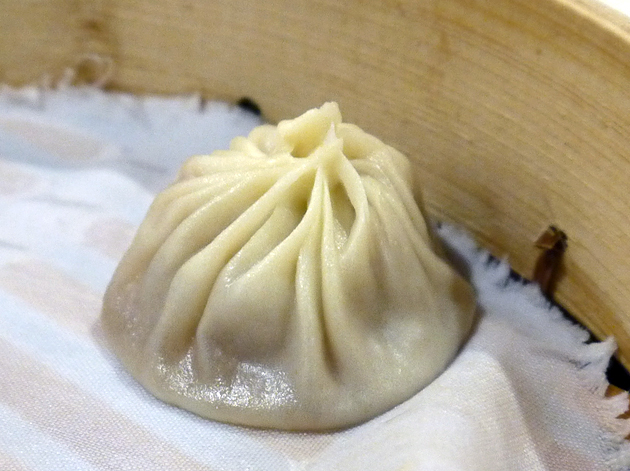 There wasn’t quite as much soup inside these xiaolongbao as in the other varieties, but the gently salty savouriness of what soup there was had been toned down to let the truffles and the pork take centre stage. 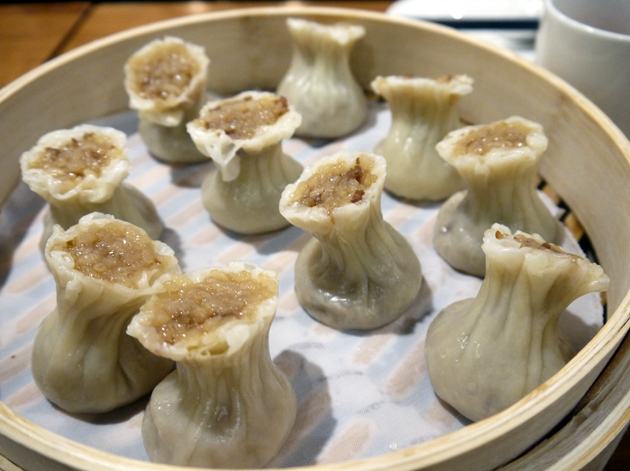 These little beauties easily rank among the best things I had eaten during my time in Taipei. One of the more expensive dishes on the menu. To avoid falling into a rut NyanMaru and I made a conscious effort to try some of the other types of dumplings available on the menu. The steamed pork and sticky rice dumplings sound and look rather odd, but the starchy, small grained clumps of rice provided a hearty and slightly sweet counterpart to the juicy pork. 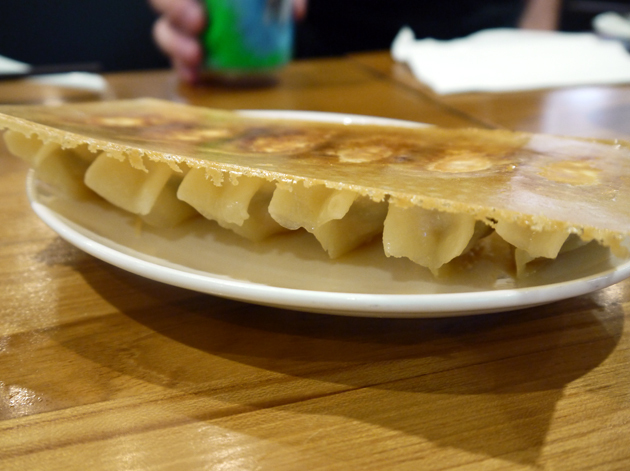 The grilled prawn dumplings had an even odder appearance than the pork and sticky rice dumplings. 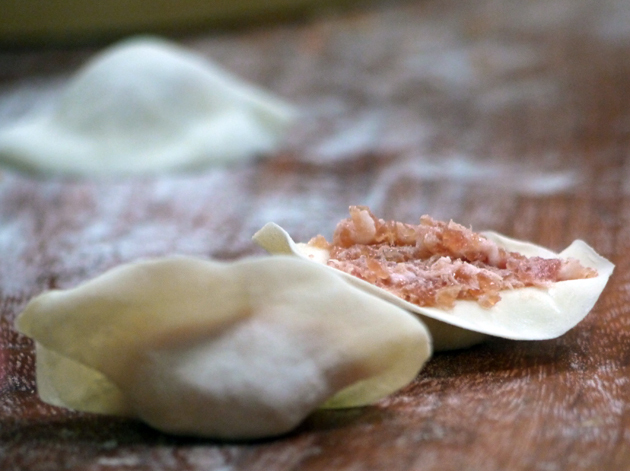 All of the individual dumplings were joined together by a thin crispy layer of buttery pastry and they have to be snapped apart with some chopsticks. The eggy butteriness of the base compliments the saltiness of the prawn filling and the supple dumpling skins surprisingly well. NyanMaru clearly has a less iron-plated palate than I do as he found the steamed prawn dumplings in spicy sauce a bit too piquant. 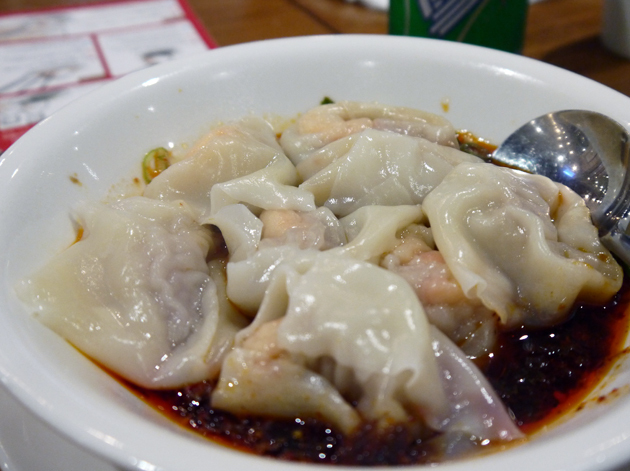 I found them only moderately spicy and enjoyed the tanginess of these wonton-style dumplings. Was the spiciness turned down for us Westerners? NyanMaru was fit to burst by this point, but I managed to find a little more room for some white fish and vegetable dumplings. I couldn’t quite identify either the fish or the vegetables in question, but the crisp and refreshing filling was a pleasing way to finish an evening of unrepentant dumpling gluttony. Tonight you swim with the fishes. 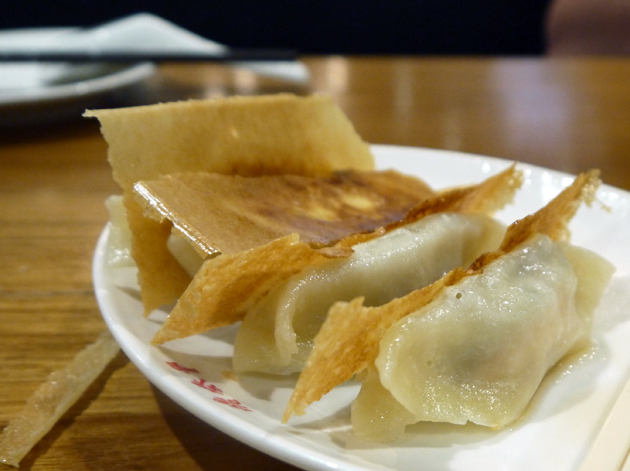 If you’re in Taipei then you owe it to yourself to make your way to a branch of Din Tai Fung. 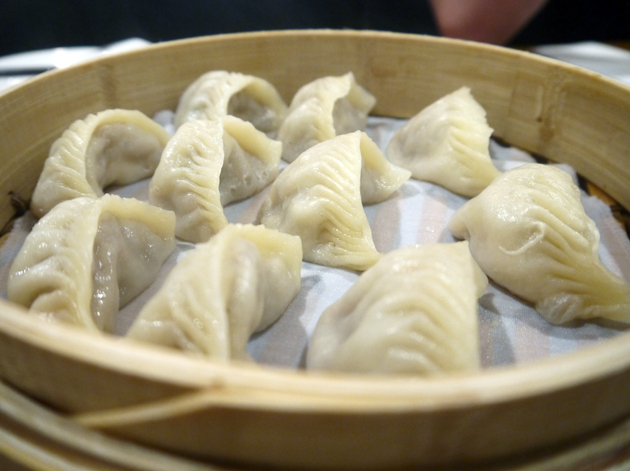 Skip breakfast, ignore anything that isn’t a dumpling, loosen your belt and prepare yourself for some rather good dumplings at a price that is ridiculously low by British standards. Opening Hours: Sunday-Thursday 11.00-21.30. Friday-Saturday 11.00-22.00. 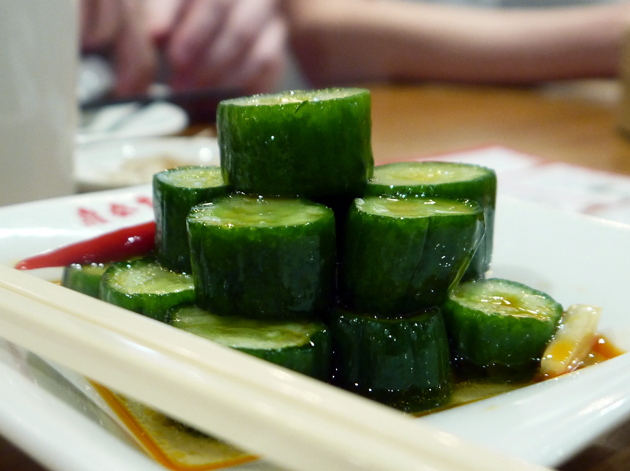 Tags: cucumber, drunken chicken, dumplings, restaurant, review, taipei, taiwan, Xiaolongbao. Bookmark the permalink. We were in Din Tai Fung in Beijing: the dishes were almost exactly the same, except that it was not as cheap… i think roughly we paid 15gbp per head, and we ate much less. 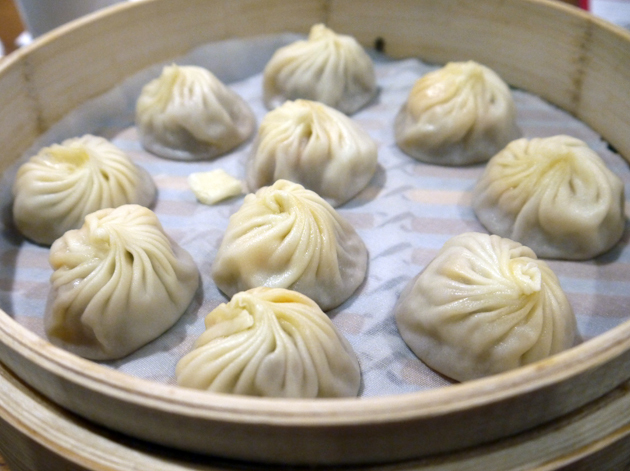 it appears that in Beijing Din Tai Fung is destinating rich upper end clients and westerners..
also we were disappointed – we didnt come too late and already all the chicken dumplings were missing!